If you’re in the process of planning your California wedding, you’re probably looking into different catering options for your big day. 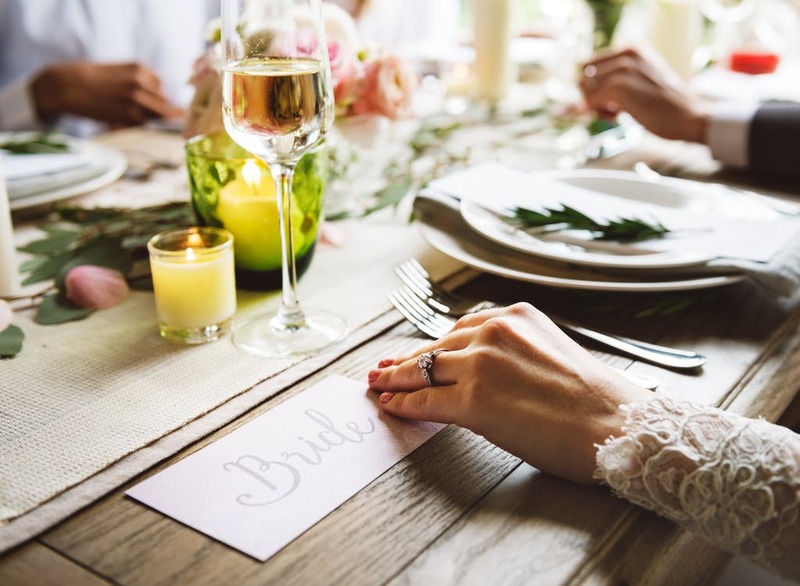 With the notable surge in food-centric media (cooking shows, foodie Instagram accounts, and celebrity chefs), today’s couples are looking for more when it comes to their wedding catering, and the standard chicken and beef entrees just won’t cut it anymore. 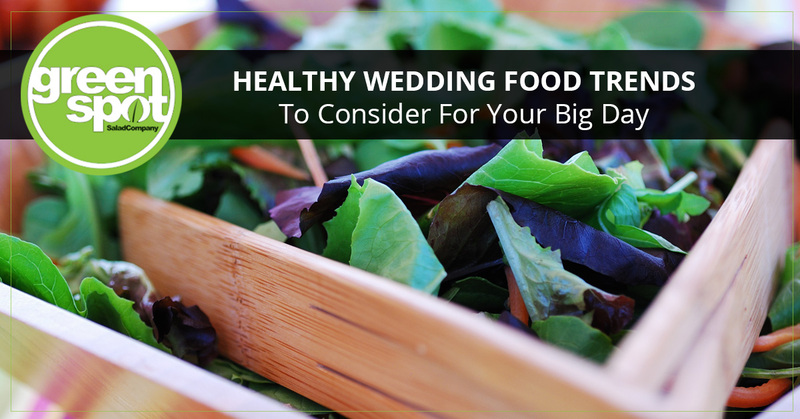 While your wedding food doesn’t need to be the main attraction, it should be good, and preferably healthy. In this blog, we’ll look at some popular healthy wedding food trends to consider for your wedding day, so you can serve your guests a delicious and nutritious meal without breaking the bank. At Greenspot Salad Company in San Diego, we pride ourself on serving foods that are completely free of hormones, high fructose corn syrup, and other additives that can be harmful to your health. In addition to our two salad bar locations, we also specialize in catering services for weddings, birthdays, anniversary parties, and more. Check out our healthy and nutritious catering menu online or contact us today to learn more! These exquisite, bite-sized snack foods are often served before the main course at a wedding or during the cocktail hour. Many wedding guests love to indulge in tasty finger foods, however many of the hors d’oeuvres served by catering companies can be surprisingly unhealthy. From bacon wrapped chicken to loaded potato skins, there are many delicious and tasty options available to choose from for your big day. Instead of removing these tasty snacks from your wedding menu entirely, consider replacing certain ingredients with healthier alternatives. Once you’ve decided which catering company you’d like to work with, schedule a time to sit down with the head chef to discuss some healthy finger food alternatives. The chef may suggest vegetable kabobs or grilled vegetable skewers, small pieces of broiled or grilled fish, and pure fruit cocktails. As you start to interview catering companies, make sure to ask them where they purchase their ingredients from. There are several catering companies and restaurants throughout California that source all of their food locally. Make sure the company you choose uses a variety of local, fresh, organic ingredients to ensure you’re getting the most bang for your buck. At Greenspot Salad Company, we’re committed to providing our customers with fresh, handmade meals using only premium and natural ingredients. Our menus are very flexible and we are happy to accommodate all types of food allergies and dietary restrictions. 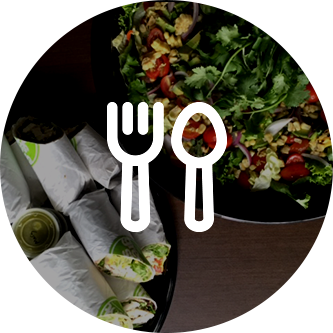 If you have any questions about our catering services or you’d like to learn more about our delicious salads and wraps, contact us today! While the heart of a wedding meal lies in the entree, you may want to consider incorporating a healthy salad into your menu for guests to eat before their entree arrives. You could serve your salad in a family-style fashion, which can save you time and money on catering expenses. This simply means your guests will pass the salad bowls to each other, which can be a fun way to get to know people they’ve never met. At Greenspot Salad Company, we offer a large variety of healthy and nutritious salads for weddings, anniversaries, birthday parties, and more. Let’s take a look at some of our most popular wedding salads below. Mediterranean Salad – The perfect salad to complement a Greek wedding, our mediterranean salad is jam packed with all of your favorite vegetables. Built on a romaine lettuce base, we use fresh cut tomatoes, cucumbers, red onions, and kalamata olives to decorate this heart healthy salad. Our chefs then top the salad off with creamy feta cheese and a light Greek vinaigrette. Caesar Salad – Nothing says elegance like a traditional caesar salad. Our caesar salads are created using locally sourced romaine lettuce, parmesan cheese, croutons, and a creamy caesar dressing. Powerplant Salad – If you truly want to impress your guests, consider serving our delicious Powerplant salad. Our chefs create this salad from fresh spinach, carrots, radish sprouts, garbanzo beans, almonds, and top it off with a Goddess dressing. Garden Salad – If you’re looking for a salad that’s a bit more traditional, our garden salad will easily do the trick. Made from fresh house greens, tomatoes, cucumbers, carrots, green onion, and croutons, we top this salad with a sundried tomato basil vinaigrette that all of your guests will love. 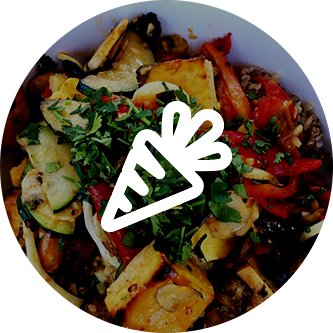 Roasted Veggie Salad – For a hearty salad, you may want to consider our roasted veggie salad. We serve this salad with roasted carrots, eggplant, roasted red pepper, grilled zucchini, and spring mix. Topped with a light olive oil and vinegar dressing, this salad is packed with healthy and natural ingredients. Cobb Salad – Who doesn’t love a cobb salad? Our cobb salad begins with a romaine lettuce base before it is topped with fresh tomatoes, carrots, eggs, avocado, and mouth-watering bacon. We finish this salad with a light spread of blue cheese dressing for a delicious and satisfying taste. As you can see, there are many ways to make a healthy and fun wedding menu. 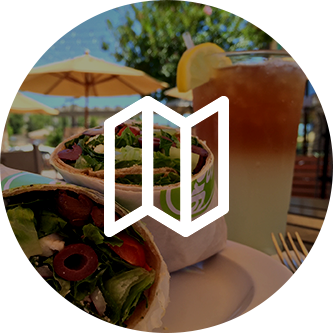 If you live in San Diego and you’re looking for a catering company to help you with salads, wraps, and more, contact Greenspot Salad Company today. In addition to our catering services, we offer two convenient restaurant locations in Sorrento Valley and 4S Ranch, and we would love to see you!